How to find all dependencies of a table in Sql Server? First of all we shouldn’t use the system stored procedure sp_depends for this as it is not reliable. For more details on sp_depends you can refer to the article sp_depends results are not reliable. For this in Sql server 2008 new Dynamic Management Function sys.dm_sql_referencing_entities is introduced. This dynamic management function provides all the entities in the current database that refer to the specified table. Let us understand this with an example. First create a table, then a stored procedure which references the table. Note: 1) This Dynamic Management Function is introduced as a part of Sql Server 2008. So above script works in Sql Server version 2008 and above. 2) While specifying the table name please include schema name also, otherwise result will not display the dependencies. How to Insert Stored Procedure result into a table in Sql Server? How to find all the objects referenced by the stored procedure in Sql Server? Please correct me if my understanding is not correct. Comments are always welcome. How to find referenced/dependent objects (like Table, Function etc) of a Stored Procedure/Function in Sql Server? For this in Sql server 2008 new Dynamic Management Function sys.dm_sql_referenced_entities is introduced. This dynamic management function provides all the entities in the current database which are referenced by a stored procedure or function. 2) While specifying the stored procedure name please include schema name also, otherwise referenced objects list will not be displayed. sp_depends System Stored procedure will give the list of referencing entities for a table/view and list of referenced entities by the stored procedure/view/function. As per MSDN this system stored procedure is going to be removed from the future versions of the Sql Server. sp_depends results are not always reliable/accurate/correct. Good and reliable alternative for sp_depends are the DMV’s: sys.dm_sql_referencing_entities and sys.dm_sql_referenced_entities. Object does not reference any object, and no objects reference it. 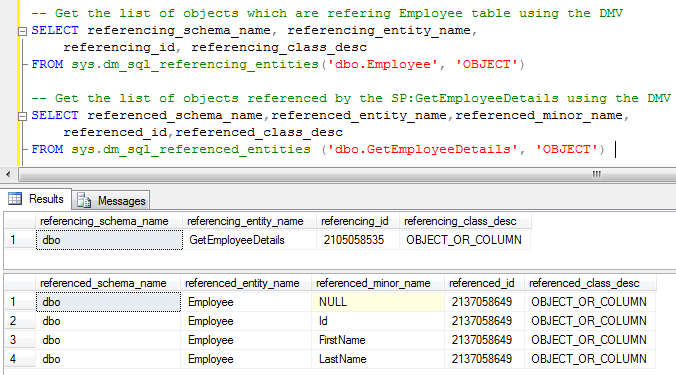 Both the sp_depends statements in the above script are not returning the referencing/referenced objects list. For example the stored procedure dbo.GetEmployeeDetails is referring the Employee table but sp_dpends is not providing this dependency information. Reason for this is: Stored procedure dbo.GetEmployeeDetails which is refereeing to this Employee table is created first and then the employee table in other words we call it as deferred resolution. Note: These two DMV’s are introduced as a part of Sql Server 2008. So this alternate solution works for Sql Server version 2008 and above. You may also like to read my other article: How to Insert Stored Procedure result into a table in Sql Server? This article basically focuses towards the introduction of Sequences with extensive list of examples. To know about Sequence Limitations and Sequence Cache Management and internals you may like to visit the articles: Sequence Limitations and restrictions with Extensive List of examples and Sequence Cache Management and Internals with examples. Sequence is used to generate database-wide sequential number, but identity column is tied to a table. Sequence is not associated with a table. Same sequence can be used in multiple tables. It can be used in insert statement to insert identity values, it can also be used in T-Sql Scripts. Note: Here GO 3 statement executes the statement above it 3 times. Batch execution completed 3 times. Start with: the initial value to start with sequence. Increment by: the step by which the values will get incremented or decremented. Minvalue: the minimum value of the sequence. Maxvalue: the maximum value of the sequence. Cycle / No Cycle: to recycle the sequence once it reaches to the maximum or minimum (if increment by is a negative number). Cache / No Cache: to pre-allocate the number of sequences specified by the given value.